A Russian Soyuz rocket and TMA-15M spacecraft blast off from Baikonur Cosmodrome, Kazakhstan on a mission to ferry a new crew to the International Space Station on Nov. 23, 2014. 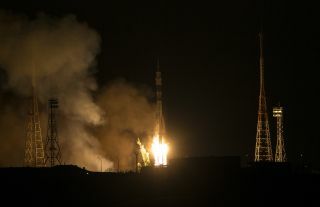 Riding the rocket into orbit were NASA astronaut Terry Virts, European Space Agency astronaut Samantha Cristoforetti and Russian cosmonaut Anton Shkaplerov. Three new crewmembers arrived at the International Space Station late Sunday (Nov. 23), doubling the orbiting lab's population back up to its full six-person strength. NASA astronaut Terry Virts, European Space Agency astronaut Samantha Cristoforetti and cosmonaut Anton Shkaplerov blasted off atop a Russian Soyuz rocket from the Baikonur Cosmodrome in Kazakhstan at 4:01 p.m. EST (2101 GMT, 3:01 a.m. local time in Baikonur). The trio reached the space station about six hours later after a quick trip through space. A Russian Soyuz TMA-15M spacecraft carrying three new members of the Expedition 42 crew approaches the International Space Station ahead of docking on Nov. 23, 2014. Virts is planning on sharing his experiences in space via social media websites like Twitter. The NASA astronaut is planning to take photos of his views of the planet to help people experience a little bit of what spaceflight is like. "It's such a unique experience and such a small number of people ever get to leave Earth, so I'm going to be using Twitter and Instagram to share pictures," Virts told Space.com before launch. "@AstroTerry is the call-sign [Twitter handle]. And hopefully I can just share the adventure that I'm going on with as many people as possible around the world." Russia's Soyuz spacecraft are currently the only spaceflight vehicle that can transport NASA astronauts to the space station. NASA officials are hoping that will change in the near future however. Officials are planning to start using spacecraft developed by SpaceX and Boeing to ferry astronauts to and from the space station by 2017. While Soyuz spacecraft are the only crewed vehicles that fly to the space station now, there are other crafts that visit the orbiting outpost on a regular basis. Private spaceflight companies SpaceX and Orbital Sciences fly robotic cargo missions to the station, while Russia's Progress vehicles also deliver supplies to the station. Japan's robotic H-2 Transfer Vehicles also fly equipment to the laboratory, and the European Space Agency's own Automated Transfer Vehicle fleet launching its fifth and last cargo mission to the station earlier this year. Once they arrive at the station, the three crewmembers will join NASA's Barry Wilmore and cosmonauts Alexander Samokutyaev and Elena Serova as part of the Expedition 42 crew. Construction of the $100 billion International Space Station began in 1998. The laboratory in space has been staffed by rotating crews of astronauts and cosmonauts since 2000.